He says the new government should pursue "dialogue with all the parties"
(CNN) -- After 30 years of mostly unchallenged rule, Egyptian President Hosni Mubarak opened the door Sunday to talks with rival political parties while calling out those who, he claimed, used religion to "spread fear" through rampant hooliganism. According to a transcript of his comments to leaders of his new government read on state-run Nile TV, Mubarak acknowledged what he called "peaceful demonstrations" as well as grievances about the economy. Thousands of protesters have hit the streets of Cairo, Alexandria and beyond calling for the president's ouster as well as substantial reforms. "The current stage requires us to reorganize the country's priorities in a way that acknowledges the legitimate demands of the people," he said. The president, again recognizing the depth of the unrest, urged those charged with shaping the new Cabinet -- specifically, his newly appointed Prime Minister Ahmed Shafiq -- to pursue "a wide range of dialogue with all the (political) parties." Such discussions, he said, "will achieve the democratic process." Mubarak called on new government leaders to "stand against anyone committing any forms of corruption" and stressed "the necessity to continue with fair, serious and effective new steps for more political, constitutional and legislative reforms." He called on new government leaders to "stop all the violence by whoever commits it," while appearing to criticize the Muslim Brotherhood, the country's largest opposition party. 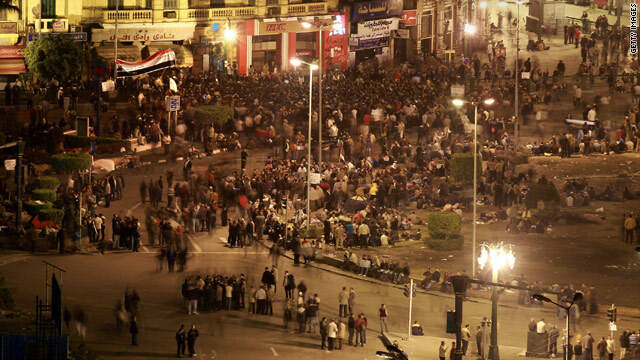 "The citizens and the young people of Egypt have gone out to the streets in peaceful demonstration asking for their right for the freedom of speech," Mubarak said. "However, their demonstrations have been infiltrated by a group of people who use the name of religion who don't take into consideration the constitution rights and citizenship values." The president claimed that such people of "giving the chance for criminal groups to loot and confiscate public and private property, spread fires and spread fear." Mubarak commanded the new leaders "to take care of the people," so that they again felt safe from looters and other criminal elements. Mubarak expressed hope that the military could succeed in protecting Egypt and its institutions and soon go back to its original goal, "which is to defend the country and its sovereignty." In the comments, described as the third statement by Egypt's armed forces since the unrest began, the soldier also asked citizens to help detain outlaws as well as the hundreds who have recently escaped from prisons. Whereas Mubarak's earlier speech dwelled mostly on security, his comments Sunday touched relatively more on substantive political and economic reforms. The president offered few specific ideas, besides ordering that government subsidies not be touched. Yet he did charge the new government to "regain the trust in our economy." He mentioned the need to "control unemployment," keep inflation low and keep prices of key commodities in check. "I trust in your ability to realize new economic achievements (and) to relieve the suffering of the people," Mubarak said.